Looking a bit heftier and a lot older, Mark Morris can no longer be called the enfant terrible of the dance world. But, as he shared company bows at the end of the Berkeley season opener, the gray-bearded choreographer, wrapped in a voluminous blue shawl, still seemed very much the impish eccentric. The opening piece on the first program, however, &#147;Somebody&#146;s Coming to See Me Tonight,&#148; was anything but eccentric. Set to the songs of Stephen Foster which were sung live by the American Bach Soloists, it was innocence personified: somewhat bland, occasionally hokey and exhibiting very little of the quirky choreography for which Morris is known. The ballet, done barefoot in vaguely old-timey costumes, is pretty but, especially in the first half, has a sameness of movement that echoes the sameness of the songs. Things picked up toward the end, with Foster&#146;s setting of the Bedroom Scene from Shakespeare&#146;s Romeo and Juliet which finally gave at least two of the dancers something dramatic to do. &#147;Somebody&#148; concludes with a rollicking &#147;Katie Bell&#148; and the final &#147;Come Where My Love Lies Dreaming,&#148; both a cut above much of what went before. The world premiere on the program , &#147;Candleflowerdance,&#148; is set to Stravinsky&#146;s Serenade in A Major. Befitting the title, the stage setting had a piano &#150; ably played by Steven Beck &#150; stage left, with a pot of flowers at the side, and a bunch of candles burning in glasses at the other side of the stage. An ensemble piece, dedicated to the late Susan Sontag, it precisely mirrors the music &#150; a Morris trademark &#150; with five dancers dressed in casual slacks and shirts. Beginning with only arm movements, it segues to a lot of push, pull and lean, collapse. There is robotic movement and another Morris specialty, the contrast of stillness and movement. An absorbing thing of beauty, &#147;Candleflowerdance&#148; is a worthy addition to the Morris oeuvre. The best was saved for the last. &#147;Rhymes With Silver,&#148; a 1997 work set to a ravishing score by the late California composer Lou Harrison, which also premiered in Berkeley, was mesmerizing. Scored for violin, viola, piano, percussion and cello, the music begins with an overture, elegantly performed by cellist Wolfram Koessel. 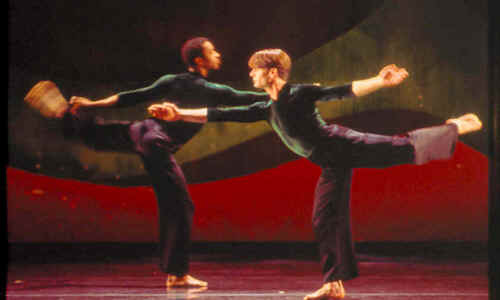 The curtain then rises on a garish red and green backdrop of abstract squiggles, against which the lighting changes dramatically throughout the dance. The sixteen dancers are dressed in green velvet tops and flowing, silky black pants. And, again, barefoot. As Harrison&#146;s score moves all over the map from vaguely Asian themes to flowing, lyrical passages to a jazzy tango to what could be a Celtic lullaby to jungle drums, the movement follows suit with ritualistic, robotic line dancing with more arms than feet in motion to angst-filled bends and arabesques to skipping and shoulder shrugs with lots of kicks and stomps. It brought the house down.